© Mouafo et al. ; Licensee Bentham Open. Resistance genotypes in pol gene of HIV-1 were obtained by the ViroSeq® HIV-1 Genotyping System v2.0 (Celera Diagnostics, Alameda, CA, USA) in 138 of 145 (95%) antiretroviral treatment-experienced adults in virological failure living in Central Africa (Cameroon, Central African Republic, Chad, Gabon). HIV-1 group M exhibited broad genetic diversity. Performance of the 7 ViroSeq® sequencing primers showed high failure rate, from 3% to 76% (D: 76%; F: 17%; A and H: 15%; G and B: 4%; C: 3%). These findings emphasize the need of updating the ViroSeq® HIV-1 genotyping system for non-B subtypes HIV-1. Keywords: Central Africa, non-B subtypes HIV-1, VirosSeq®HIV-1 Genotyping System v2.0. A good identification of drug resistance mutations requires successful sequencing of both forward and reverse sequences to confirm mixture peaks and exclude possible bias in the form of noise peaks that can result from the use of a unique sequence . Furthermore, HIV-1 genetic diversity is well known to affect the performance of drug resistance genotyping assays [1,2]. The ViroSeq® HIV-1 Genotyping System v2.0 (Celera Diagnostics, Alameda, CA, USA) is widely used for assessing antiretroviral drug resistance mutations . The assay has been developed using primers mostly associated with subtype B HIV-1 . High failure rates of ViroSeq® sequencing primers A, B, C, D, F, G and H, were reported in 2011 in Cameroon  and in 2012 in Senegal . This prompts us to confirm these latter observations in other sub-Saharan African countries where non-B subtypes HIV-1 are mostly prevalent. The study population consisted of 145 HIV-1-infected patients followed in health care centers in Douala, Cameroon (n=42), Bangui, Central African Republic (n=35), N'Djamena, Chad (n=38) and Libreville, Gabon (n=30). All patients were receiving first or second-line antiretroviral treatment according to the World Health Organization (WHO) recommendations [7,8], and were in virological failure according to the 2013-revised WHO criteria, i.e. 1,000 copies/ml . Plasma samples from 37 adults followed at hospital Européen Georges Pompidou, Paris, and infected by subtype B HIV-1 from France were also selected. For each patient, resistance genotype testing was prescribed by the clinicians to adapt the treatment. Genotypic analysis of reverse transcriptase and protease HIV-1 genes were carried out on plasma samples, transported frozen in dry ice to the virology laboratory of Hôpital Européen Georges Pompidou, Paris, France, using the commercial assay ViroSeq® HIV-1 Genotyping System v2.0, which contains all the necessary reagents for RNA extraction, reverse transcription, PCR amplification, PCR product purification and sequencing reactions. A final PCR product of 1.8 kb was obtained and seven sequencing primers (A, B, C, D, F, G, and H) were provided to sequence DNA strands. The reactions were carried out according to the manufacturer’s instructions, and the resulting pol sequences were aligned using the ViroSeq® HIV-1 Genotyping System Software v2.6 (Celera Diagnostics). Finally, HIV-1 subtype was deduced from the resulting pol gene sequences in FASTA format using the REGA HIV-1 & 2 Automated Subtyping Tool (Version 2.0) available on the web site of Bioafrica (www.bioafrica.net). The ViroSeq®pol genes sequences from 37 viruses from adults living in France were used as controls for subtype B HIV-1. Accession numbers of pol sequences deposited in GenBank database were as follows: from Cameroon, KF735813 to KF735849, Central African Republic, JF803976 to JF804011, Chad, FJ688173 to FJ688209, Gabon KC978895 to KC978921 and KC991139 to KC991141, and France, KF889013 to KF889049. Out of 145 plasma samples, 138 could be amplified by the ViroSeq® assay, leading to an amplification rate of 95% and final successful rate of sequencing alignment analysis, on plasma samples from adults living in Central Africa. All samples successfully amplified were further taken to the sequencing phase. All HIV-1 belong to group M, with broad genetic diversity in HIV-1 subtypes distribution (Fig. 1). All (100%) plasma samples from adults infected by subtype B HIV-1 from Gabon and from France (taken as controls) could be amplified by the ViroSeq® assay. 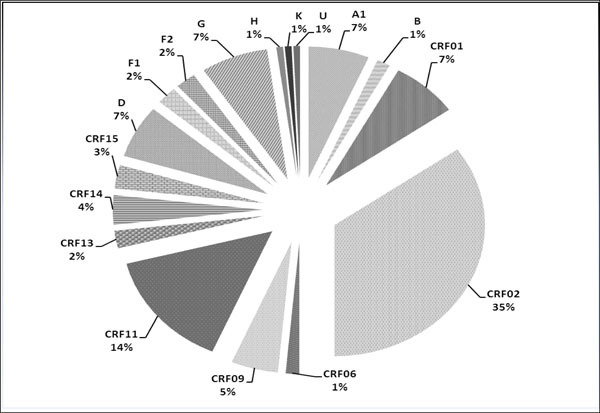 Percentages of sub-types and circulating recombinant forms (CRF) in 138 HIV-1 strains from HIV-1-infected individuals living in Central Africa (Cameroon, Central African Republic, Chad, Gabon). The results of sequencing were given as failure when signal referred to primers that generated sequences had two or more overlapping chromatograms, partially or on the full sequence length, with no possibility for distinguishing existing mutation, and success when sequencing was accomplished. The results are depicted in Table 1 for Central Africa and Table 2 for each of the four study countries. Overall, the primer D showed the highest failure rate, followed by the primers F, A and H. The lowest failure rate was recorded with primers C and B. By comparison with HIV-1 subtype B pol sequences from France, the number of sequences for which more than 1 primer failed was higher for HIV-1 from Central Africa than for subtype B HIV-1 from France (30% versus 13%, P<0.04 by X2-test), and the failing sequencing primers for Central African HIV-1 were primers D (76% versus 38%, P<0.001), F (17% versus 3%, P<0.03) and H (15% versus 0%, P<0.02) (Table 2). Performance of ViroSeq® sequencing primers A, B, C, D, F, G and H, for each subtype and circulating recombinant forms of 138 HIV-1 from Central Africa and 37 subtype B HIV-1 from France. μ Number of negative detection; percent in brackets. a Total number of samples that were sequenced using the ViroSeq® primers. £ Control subtype B HIV-1 from France. Performance of ViroSeq® sequencing primers A, B, C, D, F, G and H, for each subtype and circulating recombinant forms of 138 HIV-1 according to 4 Central African countries (Cameroon, Central African Republic, Chad, Gabon). In the present study, the amplification rate of the ViroSeq® assay was 95% and 100% on plasma samples from adults living in Central Africa mainly infected by non-B subtype HIV-1, and in France infected by subtype B HIV-1, respectively. Amplification rates of the ViroSeq® assay lower for non-B subtypes HIV-1 than for B subtype HIV-1 were previously reported in Cameroon  and Senegal . Indeed, the performance of 4 (57%) out of 7 ViroSeq® sequencing primers in our series showed high failure rate with non-B subtypes HIV-1 from Central Africa, whereas all primers, but primer D, were associated with high efficiency rate for subtype B HIV-1. The underdetection of non-B subtypes HIV-1 likely occurs because the primers of the ViroSeq® assay have been primarily designed for subtype B HIV-1. Our observations confirm and extent previous reports in Cameroon  and Senegal , by demonstrating that the failure of some ViroSeq® sequencing primers also affects HIV-1 strains circulating in Central African Republic, Chad and Gabon. Indeed, broad genetic diversity included mainly non-B subtypes or circulating recombinant forms of HIV-1 group M was observed in these countries, as previously reported , and similarly to the broad HIV-1 genetic diversity classically reported in Cameroon . Primer D is thought to be used to solve the missequencing in case the primer A failed. However, our observations demonstrate that this problem is in fact incompletely solved, since primer D failed in more than a half of 21 of our series samples not sequenced by primer A. Furthermore, primer D showed a high failure rate by it-self (37/48, 77%) with subtype CRF02 HIV-1, the most frequent HIV-1 subtype in sub-Saharan African countries. In the series, the failure rate of primer B was 4%, a rate slightly lower than those previously reported (100% success rate) [5,6,9]. Finally, the performances of the other primers (i.e. A, C, F, G and H) were similar to those reported in Cameroon  and Senegal . Our findings also point the urgent need of improving and updating the sequencing primers of the ViroSeq® system, as previously recommended four years ago by Aghokeng and colleagues . Indeed, the ViroSeq® genotyping system is widely used in sub-Saharan Africa for routine HIV drug mutations resistance testing  and survey . Alternatively, primers for non-B subtypes HIV-1 could be used, as well as another commercially available genotyping assay such as the TRUGENE HIV-1 Genotyping assay (Siemens Healthcare Diagnostics, Tarrytown, NY) which has demonstrated high sensitivity for non-B subtype HIV-1 from Cameroon . The author contributions are as follows: Drs. LCMM, HP, CTK and LB conceived and designed the experiments. Drs. LCMM, ANM, DK and JDDL performed the experiments. Dr. FXMK analyzed the data. Drs. LCMM, HP and LB wrote the paper. All authors read and approved the final version of the manuscript. Huang DD, Eshleman SH, Brambilla DJ, Palumbo PE, Bremer JW. Evaluation of the editing process in human immunodeficiency virus type 1 genotyping. J Clin Microbiol 2003; 41: 3265-72. Peeters M, Aghokeng AF, Delaporte E. Genetic diversity among human immunodeficiency virus-1 non-B subtypes in viral load and drug resistance assays. Clin Microbiol Infect 2010; 16: 1525-31. Cunningham S, Ank B, Lewis D , et al. Performance of the Applied Biosystems ViroSeq human immunodeficiency virus type 1 (HIV-1):genotyping system for sequence-based analysis of HIV-1 in pediatric plasma samples. J Clin Microbiol 2001; 39: 1254-7. Eshleman SH, Crutcher G, Petrauskene O , et al. Sensitivity and specificity of the ViroSeq human immunodeficiency virus type 1 (HIV-1):genotyping system for detection of HIV-1 drug resistance mutations by use of an ABI PRISM 3100 genetic analyzer. J Clin Microbiol 2005; 43: 813-7. Aghokeng AF, Mpoudi-Ngole E, Chia JE, Edoul EM, Delaporte E, Peeters M. High failure rate of the ViroSeq HIV-1 genotyping system for drug resistance testing in Cameroon, a country with broad HIV-1 genetic diversity. J Clin Microbiol 2011; 49: 1635-41. Thiam M, Diop-Ndiayea H, Kebea K , et al. Performance of the ViroSeq HIV-1 genotyping system v2. on HIV-1 strains circulating in Senegal. J Virol Methods 2013; 188: 97-103. Maes B, Schrooten Y, Snoeck J , et al. Performance of ViroSeq HIV-1 Genotyping System in routine practice at a Belgian clinical laboratory. J Virol Methods 2004; 119: 45-9. Harpentier C, Gody JC, Mbitikon O , et al. Virological response and resistance profiles after 18 to 30 months of first - or second-/third-line antiretroviral treatment a cross-sectional evaluation in HIV type 1-infected children living in the Central African Republic. AIDS Res Hum Retroviruses 2012; 28: 87-94. Billong SC, Fokam J, Nkwescheu AS , et al. Early warning indicators for HIV drug resistance in Cameroon during the year 2010,. PLoS One 2012; 7(5): e36777. Maiga H, Talla F, Brasseur F , et al. Comparison of TRUGENE HIV-1 genotyping assay and ViroSeq HIV-1 genotyping system V20 to detect antiretroviral drug resistance mutations using samples from Cameroonian patients in virological failure. 17th International Conference on AIDS and STIs in Africa Cape Town South Africa 7-11 Dec 2013; p: 150.